Experience luxury and the high life this Holiday Season at Megaworld Lifestyle Malls and be rewarded with luxurious prizes and exclusive privileges in The Good Life Christmas Promo. Exciting shopping gifts and deluxe holiday packages await those who will spend P2,000 in single or accumulated receipts at any Megaworld Lifestyle Malls establishments from October 2012 to January 2013. Customers can even double their chances of winning when they use their Visa Card in paying for their purchases. A lucky customer will get to live the good life in a whole new level by winning the P1.3 million worth gift certificates in the grand draw. This exclusive giveaway entitles the winner to shopping sprees, special dining treats and various complimentary services at participating establishments in Megaworld Lifestyle Malls. Lucky winners will also get to enjoy upscale dining and leisure at Resorts World Manila. Two winning patrons can relax and get cozy, with each either getting gift certificates from Maxims Hotel or complimentary vouchers from Remington Hotel. A first-class food treat for the family is also up for grabs with the winner getting dining certificates at Mercado, Noodle Works, Passion, Ginzadon and The Terrace. Another winner, meanwhile, gets to experience the most advanced arcade and recreational games at GameZoo with free credits that can be exchanged for a Gamezoo Game Card. Jetsetters can also win their dream vacation in The Good Life Christmas Promo with tickets for two to Moscow via Qatar Airways, an Asian cruise for four or a Romantic getaway at Misibis Bay. Celebrate the Holiday Season at Megaworld Lifestyle Malls and get a chance to win a brand new Volvo S80 or Volvo C30 and other luxurious giveaways. Shop and dine now at these Megaworld Lifestyle Malls: Eastwood Mall, Eastwood City Walk, Eastwood Cyber & Fashion Mall, Lucky Chinatown, Newport Mall at Resorts World Manila, Burgos Circle at Forbes Town Center, The Clubhouse at Temple Drive, Paseo Center Makati and Venice Piazza at McKinley Hill. 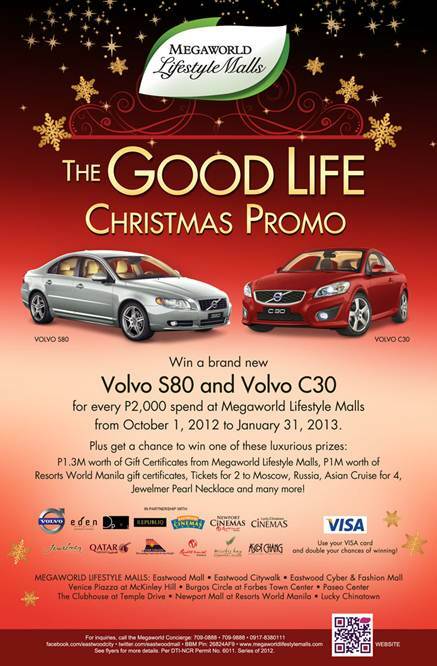 The grand raffle draw of the Good Life Christmas Promo is on February 5, 2013. Monthly raffle draws begin October 29. For more inquiries, call the Megaworld Lifestyle Malls Concierge at 709-9888, 709-0888, 0917-8380111 or visit www.megaworldlifestylemalls.com. Per DTI-NCR Permit No. 6011, Series of 2012. See posters and flyers for more details.